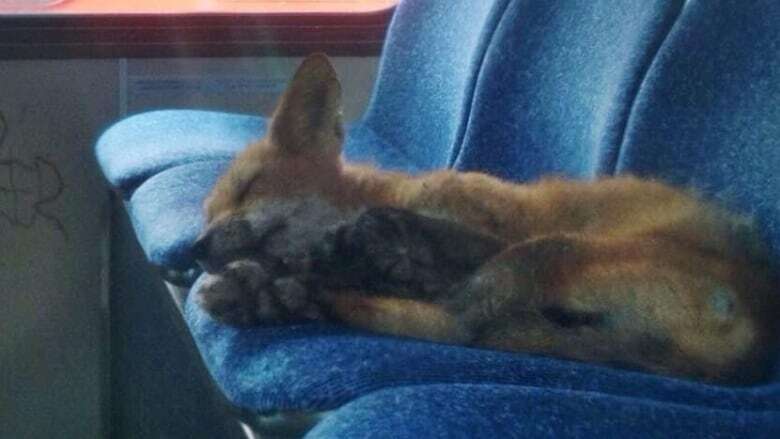 A fox was found sleeping on an Ottawa city bus, and a photograph of the napping animal is making a big splash online. An OC Transpo worker discovered this fox sleeping on an Ottawa city bus. A fox was found sleeping on the back seats of an Ottawa city bus, and a photograph of the napping animal is making a big splash online. To check out a compilation of the online reaction, click here. An OC Transpo employee made the cute discovery at a bus parking garage on Industrial Avenue in Ottawa's east end on Sunday morning. The bus was parked in the garage for regular maintenance, and the fox got inside through the door of the bus, which had been left open. The employee took a photo of the sleeping fox, and CBC reporter Stu Mills later obtained the photo and tweeted it out. Within minutes, it had been re-tweeted hundreds of times. Later, OC Transpo posted a message on its Twitter feed that the fox left the bus on its own after getting some shut-eye.